If ever trying to fix Samsung Galaxy J5 J510H Touch Screen failure issues and you’ll do replacing the touch plate module, trying to calibrate the touch screen setting but unresponsive and restoring, upgrading and flashing the device firmware but nothing happens, the problem still exists and the touch screen left unresponsive. This sometimes happens if the device suffered due to a wet damaged, heavily dropped and any related damaged accidentally done by the user. In this case, only a hardware repair may only help solve the problem. 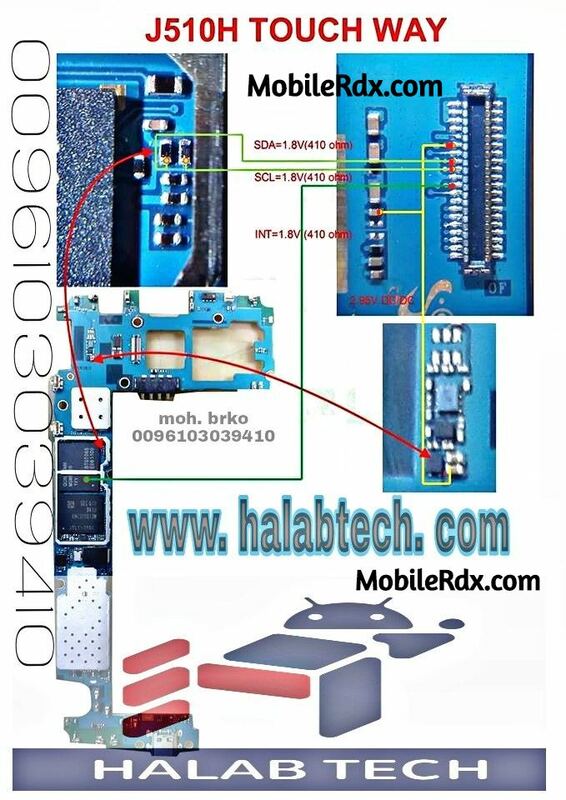 This solution below shows the Samsung Galaxy J5 J510H PCB board components that hold and control the touch screen panel to work. Phone touch screen could stop working for many reasons. Here are the most common reasons why your Samsung Galaxy J5 J510H. don’t respond to your touch. Android system crashes after a firmware update, ROM flashing, etc. Wrong settings. A factory reset could restore the phone to default settings and fix the problem. Plug-in any other good Touch Screen and Check. This step is to verify whether the problem is in hardware or Samsung Galaxy J5 touch screen is faulty.